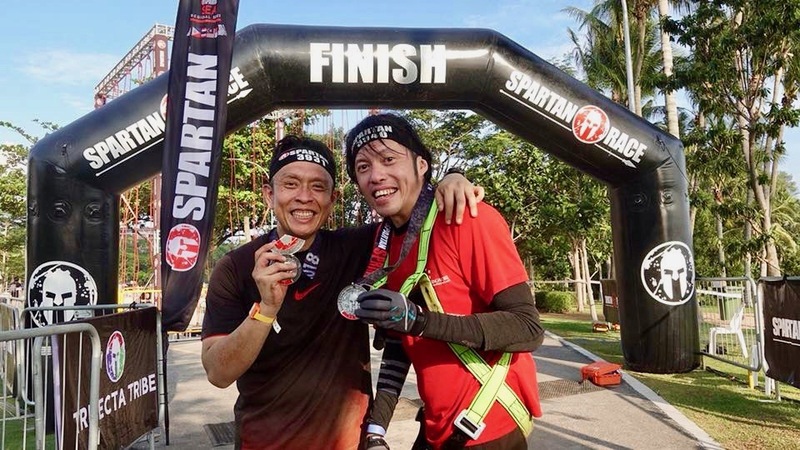 A personal first for Dr Darren Chua (right) – finishing the rigorous Spartan Race this year, 18 years after his massive stroke. Med school buddy Timothy (left) ran the race with him. Photos courtesy of Dr Darren Chua. The close bunch of university friends – newly graduated medical students – felt as though they were dreaming. Five gruelling years of medical school were finally behind them. Their only agenda now: A no-holds-barred, party-til-you-pass-out grad trip to Greece. In high spirits, they sailed on an impossibly azure Aegean Sea. Skydived from an impossibly dizzying height. Partied hard and congratulated themselves on making it through an impossible marathon of a degree programme. Impossible. Yet the possibilities rolling out before them were tangible: A medical career, marriage, the 5Cs of credit card, condo, car, country club, cash. “Nothing’s going to stop me now,” was the heady refrain in 24-year-old Darren Chua’s head as he fixed a bold gaze on the future. The friends were done with their final exam paper in March 2000. By early April they were in Greece to “celebrate, relax, chill out”. On April 28, just after his return from Greece, Chua was home alone playing computer games. In just four days, he was to start his housemanship at the Singapore General Hospital (SGH). Neurosurgery was his particular interest and he was looking forward to pursuing the specialty. “I was relaxed and just enjoying my remaining time as a ‘civilian’,” he remembers. Then, without warning, half of his vision field blinked into blackness. 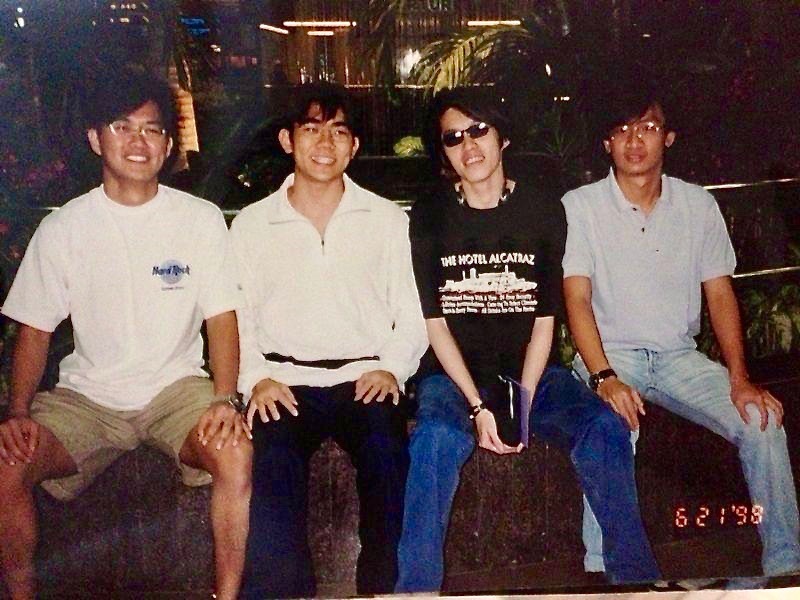 Darren (second from right) with his secondary school friends in the heady days of youth. Many remain his close friends. “It was sudden,” says Chua. “As doctors, we are trained to rationalise things and not panic. So I tried to think through the possible causes. I didn’t believe that I was having a stroke. When you’re 24, you think you are invincible. “I remember thinking, ‘I’d better rest and assess the situation.’ I got to my bed, sat down … and that’s when the headaches came. Pounding headaches. Increasingly intense. He was 24. And he was having a stroke. 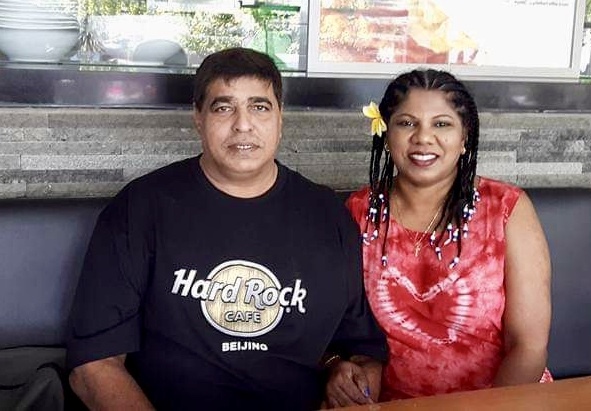 His head hammering and his vision compromised, Chua – whose parents were on a cruise and his sister out with friends – called his then girlfriend. “She said she would come and drive me to the nearest clinic. But 10 minutes later, she called again saying she was stuck in a traffic jam. She called an ambulance instead. “Being a practical person, I thought the best thing I could do was to help the situation by opening the front door for the ambulance team. “I stood up to open the front door, and immediately collapsed. The right side of my body had gone completely limp. I ended up crawling to the door, but when I looked at the bunch of five keys, I couldn’t figure out which one the door key was. That was the first time in my 24 years that I felt helpless. Chua could do nothing but wait for the ambulance, enduring the waves of headache and frightening blindness only through sheer determination. When the ambulance arrived 20 minutes later, Chua saw them break down the front door before he allowed himself to collapse. When he regained consciousness, it was three weeks later. “When I woke up, I realised that half my skull had been carved out,” Chua remembers. The doctors had had to do an emergency craniectomy. Part of his skull was removed to release the pressure and repair the haemorrhaging in his brain. Ironically, neurosurgery had been Chua’s intended specialty, and the doctor who performed his surgery had been his neurology professor in medical school. The first emotion he felt was not fear, frustration or anger, but “intense relief” at being alive. He remained half blind, was paralysed on the right side of his body and his legs, and would be unable to speak for two years. 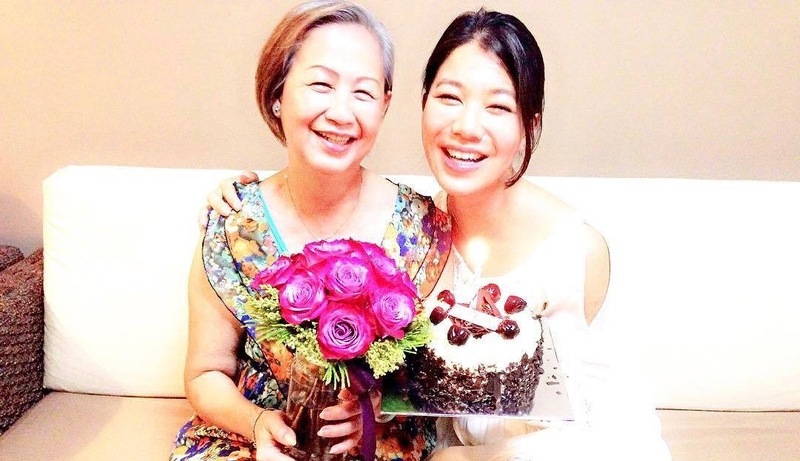 “I woke up a completely different person from who I used to be,” says Chua. He would spend the next three months in hospital and the next three years in rehabilitation. Chua had known God once. Baptised as a baby, he had grown up as an ACS (Anglo-Chinese School) boy, exposed to Christian values, attending chapel every week and Christian fellowship on Sundays. “I didn’t question the faith but I wasn’t actively seeking or pursuing God and asking the tough questions,” he recalls. He was a leader throughout his school life – “I was a kaypoh (busybody) lah, I wanted to help out and be involved in everything”. But by secondary school, preoccupied with social activities and disappointed with the hypocritical behaviour of some of his Christian friends, the teenager stopped attending church. In junior college, he read philosophy books avidly and became convinced that God was a man-made concept and everything worthwhile in his life was by his own merit. By university, God was a distant memory. He was the pilot of his own life, Chua believed. If he worked hard and stayed focused, he could achieve anything he wanted. The stroke, at the prime of his life, demolished all illusions. For three years, Chua pushed himself to try different therapies: Aquatherapy, acupuncture, gym workouts. After one year of being in a wheelchair, he was able to use a walking stick. And by the third year, he was walking unaided, albeit with a limp. Stubbornly, he was determined to get back on track as a medical officer and for the first three years, applied to the Singapore Medical Council to do so. Darren with wife Joelle at their wedding. “Each time they rejected my application, I pushed my body harder. I didn’t want to be viewed as disabled. Looking back, I was out of touch with reality. We often read about how ‘someone found God’, usually after a life event that caused them to evaluate things. But did you know that God pursues us? Facing his responsibilities, Chua stopped applying to the medical council and started work as a healthcare administrator in a hospital cluster. His then girlfriend struggled as well. The two eventually broke up. 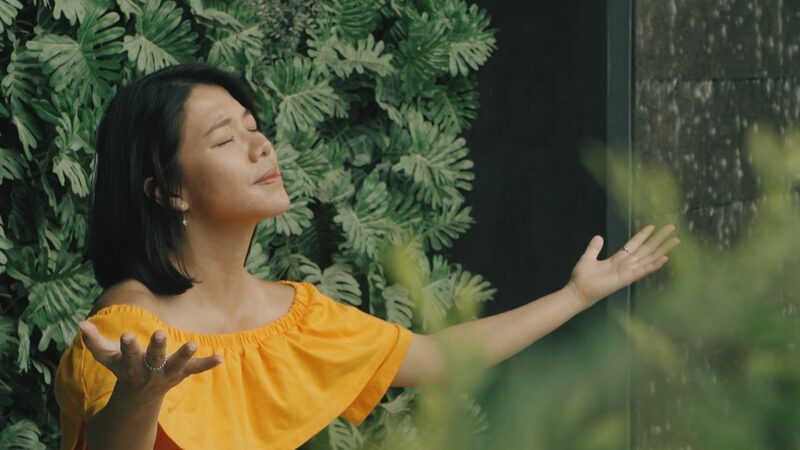 Despite the distance he had put between himself and God, Chua discovered that God was not letting go of him that easily. “We often read about how ‘someone found God’, usually after a life event that caused them to evaluate things. But did you know that God pursues us? Because of His very nature – which is love – He seeks to have a relationship with us. He created us for His glory and even the many names and titles of God reveal His pursuit,” says Christian educator Pamela Rose Williams. In the midst of his devastation, Chua met a young woman who took him back to church. “At first I went because of her. I wasn’t even speaking to God then,” says Chua frankly. “But suddenly, there would be two or three people every week asking me about my faith journey. It forced me to face God again. Darren today at his alma mater, NUS Yong Loo Lin School of Medicine, where he works on educational projects. Photo by Tan Huey Ying. Today, at 42, Chua is still partially blind and walks carefully as his right side has never regained its full strength. But his list of accomplishments post-stroke would put a perfectly abled-bodied person to shame. Darren speaking on his signature topic: Disability is only in the mind. 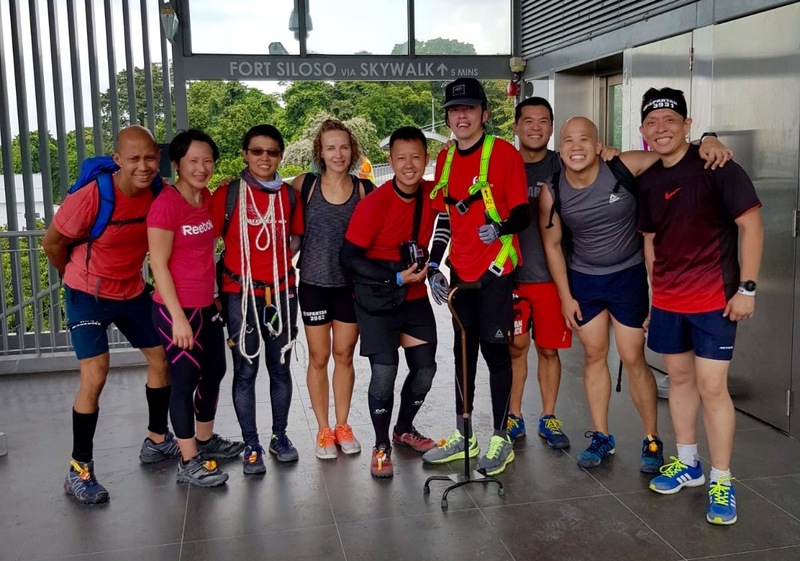 While doing his Master’s in Research at the National University of Singapore, he recalled how much he enjoyed coaching – even during his ‘A’ level years he would coach his classmates during the day, only returning home to study at night. Starting an enrichment centre – Potters Clay Education – was a natural step. He subsequently sold the centre but remains as a science teacher. 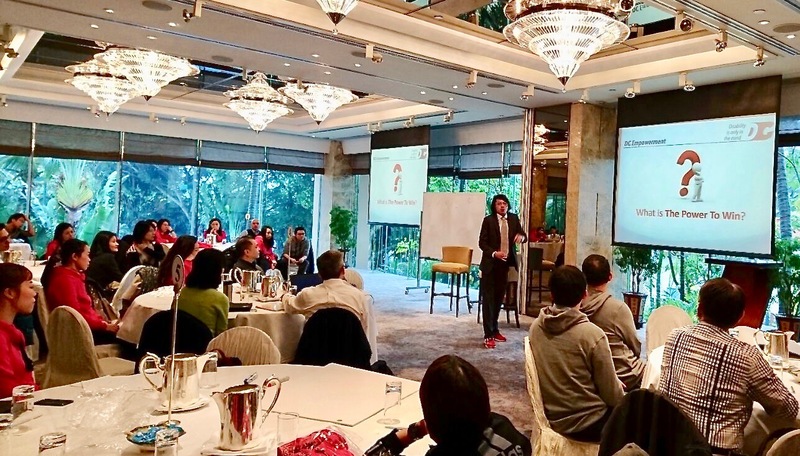 A second business, Mindset Transformation Clinic, was launched as a platform for Chua’s increasing motivational speaking engagements in schools and corporations. His signature topic: Disability is only in the mind. 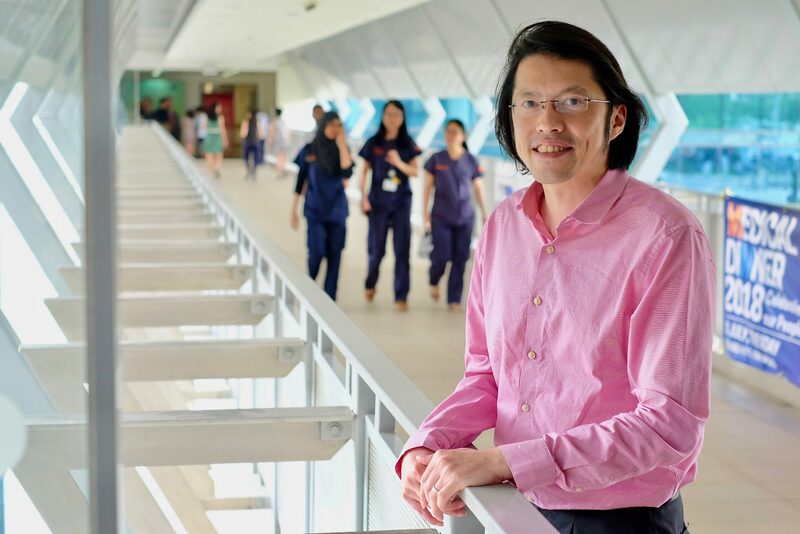 Finally, coming full circle to where this story began, he is back at his alma mater, the National University of Singapore’s Yong Loo Lin School of Medicine, working on education projects. Already a naturally driven person, he discovered that, when he partnered with God, the sky’s literally the limit. Right-handed before the stroke, Darren taught himself to play left-handed, bringing home the gold together with Jason Chee (top left) for Singapore at the ASEAN Para Games. 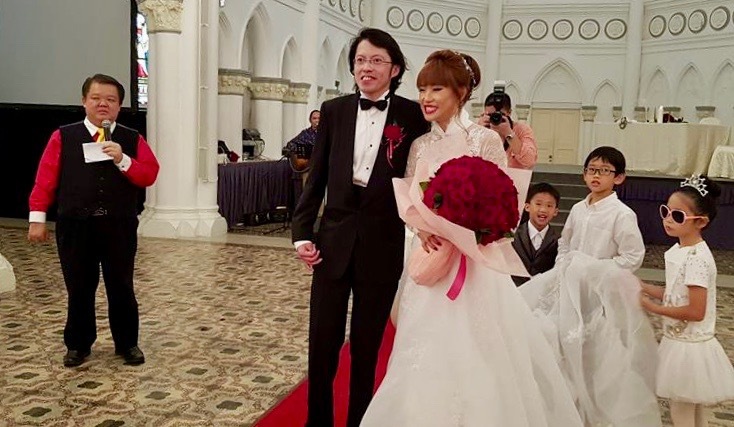 “If I didn’t come back to the faith, I would be a different person today,” says Chua, who now worships at New Creation Church with his wife Joelle. “I don’t think I would have been bitter. But I would have been aimless. “Today, as much as I can, in everything I do I try to point to a God who loves us. “He is the reason I survived the stroke. Many patients with the kind of massive stroke I had wouldn’t be able to converse or work to this level. If you talk to my surgeons, they will tell you that my recovery is a miracle. He jokes that, in some ways, he is even more well-rounded than before the stroke. Darren credits his supportive teammates for seeing him across the Spartan Race finish line. From L-R: Colin, Rachael, Phyllis, Juria, Pao, Darren, Aaron, Mark and Tim. Not in the picture: Joelle. He was never an athlete in school. But friends introduced him to physician and Paralympian Dr William Tan, who in turn introduced Chua to wheelchair table tennis. Chua now partners para athlete Jason Chee in playing for Singapore. 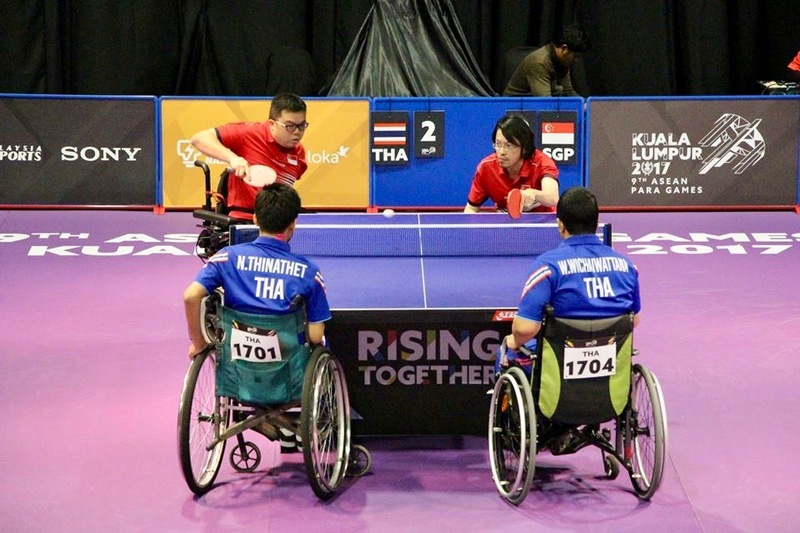 The duo won gold for Singapore in the 2015 ASEAN Para Games. “Our God-given potential is boundless. We’re only limited by what we believe. Salt&Light Managing Editor Juleen hails from the newsrooms of Singapore Press Holdings and MediaCorp Publishing. She has had two encounters with baptismal pools. The first was at age four when her mother, who was holding her hand, tripped and fell into the church baptismal pool, taking Juleen with her. The second was when she actually chose to get baptised.